Wilson Parks and Recreation Department director David Lee gives players from the Wilson City Little League Ages 10-11 team that won the District 6 championship last summer during Saturday’s WCLL Opening Day ceremonies at Southern Bank Stadium. These youngsters get ready to enter Southern Bank Stadium during the Parade of Teams to start the Wilson City Little League’s Opening Day ceremony Saturday morning. Some of the youngest Wilson City Little Leaguers start the Parade of Teams to begin the league’s 13th annual Opening Day ceremony at Southern Bank Stadium on Saturday morning. Wilson Mayor Bruce Rose delivers the ceremonial first pitch to start the Wilson City Little League season at its 13th Opening Day on Saturday morning at Southern Bank Stadium. The players on the Wilson City Little Leagues Ages 8-9 team that won the North Carolina Little League District 6 and state championships last summer were recognized as part of WCLL’s 13th Opening Day ceremony Saturday morning at Southern Bank Stadium. The Wilson Fire Department Color Guard presents the flags for the singing of the national anthem at the 13th Wilson City Little League Opening Day ceremony Saturday morning at Southern Bank Stadium. Somer Bunn sings a scintillating version of the national anthem Saturday morning at the Wilson City Little League’s 13th Opening Day ceremony at Southern Bank Stadium. 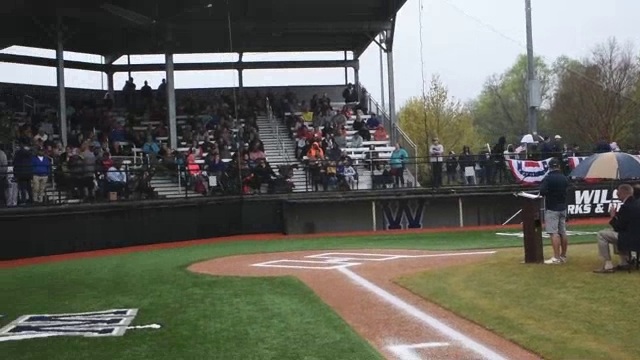 The Southern Bank Stadium grandstand was mostly full Saturday for the 13th Opening Day ceremony for Wilson City Little League. Players and coaches for Golden Circle Optimist Club have fun while waiting for the rest of the teams to enter Southern Bank Stadium at the Parade of Teams to start the Opening Day ceremony for the Wilson City Little League’s 13th season Saturday morning. Players from Breakfast Optimist enter the field at Southern Bank Stadium as part of the Parade of Teams to start the Opening Day ceremony for Wilson City Little League on Saturday morning. Players from Farris & Farris enter Southern Bank Stadium as part of the Parade of Teams for the Opening Day ceremony for the Wilson City Little League’s 13th season Saturday morning. Players from BB&T enter Southern Bank Stadium as part of the Parade of Teams in Saturday morning’s Opening Day ceremony for Wilson City Little League. Players from B&S Wholesale Tires, Inc., enter the field at Southern Bank Stadium during Saturday morning’s Opening Day ceremony for Wilson City Little League’s 13th season. Players and coaches from Pizza Inn line up on the field at Southern Bank Stadium during the Parade of Teams in the Wilson City Little League’s Opening Day ceremony Saturday morning. Players from KS Bank and ACC Lawn Care Wilson City LIttle League teams await their turn to take the field during the Parade of Teams on Saturday morning in the 13th annual Opening Day ceremony at Southern Bank Stadium. Saturday morning started out damp and a bit chilly but there were plenty of smiles to brighten up Gillette Baseball Complex as Wilson City Little League celebrated its 13th Opening Day. From the Parade of Teams that started the festivities at Southern Bank Stadium, it was clear that everyone was excited that baseball was back. Players from 35 Little League baseball teams and two Wilson Parks and Recreation Department softball teams marched into Southern Bank Stadium and onto the field. After a scintillating national anthem by Somer Bunn and the invocation from Clay Johnson, Wilson City Little League director Troy Blaser welcomed the several hundred in attendance. Robert Stokely led the Little League Pledge and Donn Holt led the Little League Parent/Volunteer Pledge before Blaser recognized the players and coaches from two WCLL All-Star teams from last summer — the Ages 8-9 team that won North Carolina Little League District 6 and state championships and the Ages 10-11 squad that won the District 6 tournament. Wilson Mayor Bruce Rose delivered a few remarks and the ceremonial first pitch, signifying that it was finally time to play ball. While the grounds were still too wet to hold the Home Run Derby and the MLB Pitch, Hit and Run competitions, 11 games were played, much to the delight of all. Leading Hitters- Luncheon Lions Club: Colton High 2-2, 1-R, 1-1B, 1-2B; Ayden Wooten 2-2, 2-1B, 2-RBI, Brandon Gattis 2-2, 1-R, 1-1B, 1-2B; Christopher Brown 2-2, 2-R, 1-1B, 1-2B, 1-RBI; Micah Jernigan 2-2, 1-R, 2-1B; Tripp Harris 1-2, 1-R, 1-2B, 1-RBI; Avery Watkins 1-2, 1-R, 1-2B, 1-RBI; Joey Cincinnati 1-2, 1-R, 1-2B, 2-RBI; Marin Chester 1-2, 1-R, 1-1B, 1-RBI; Hudson Capps 1-2, 1-R, 1-1B; Easton Martin 1-1, 1-R, 1-1B, 2-RBI. Leading Hitters- Wilson Sluggers: Mason Cambra 2-2, 1-R, 2-1B; Bently Mchenry 2-2, 2-1B; James House 2-2, 1-R, 1-1B, 1-2B; Joseph Betancourt 2-2, 1-R, 2-1B, 1-RBI; Kai’den Kent 1-2, 1-R, 1-1B; Aiden Speight 1-2, 1-R, 1-1B, 1-RBI; Jalen Felder 1-2, 1-1B, 1-RBI; Annabelle House 1-2, 1-1B, 1-RBI; Ethan Strickland 1-1, 1-1B, 1-RBI; Caiden Ellis 1-1, 1-1B; Claire Thomas 1-1, 1-1B. Leading Hitters- Tipsy Tomato: Jacob Pittman 2-2, 1-1B, 1-3B, 1-RBI; Chasen Bridgers 1-2, 1-1B; David Royer 1-2, 1-1B; Landon Carlone 1-2, 1-2B; Angel Rivera 1-2, 1-1b; Adel Seidi 1-1, 1-R, 1-1B; William Wentz 1-1, 1-1B. Leading Hitters- Sun River: Wood Berry 2-3, 2-R, 1-1B, 1-2B; Chase Hawkins 2-3, 2-R, 1-1b, 1-3B, 2-RBI; Tucker Webb 2-2, 2-R, 1-2B, 1-3B, 1-RBI; Dallas Ross 2-2, 2-R, 2-1B, 1-RBI; Peyton Easterly 2-2, 1-R, 1-1B, 1-2B, 1-RBI; Hill Black 2-2, 1-1B, 1-2b, 3-RBI; Patrick Williams 1-3, 1-R, 1-3B, 1-RBI; Willow Webb 1-2, 1-1B. Leading Hitters- KS Bank: Colton Simmons 2-3, 1-R, 2-1B; Bowman Smith 2-3, 2-1B, 3-RBI; Braxton Smith 2-2, 1-R, 1-1B, 1-3B, 1-RBI; Bella Gibson 2-2, 2-R, 2-1B, 1-RBI; Eli Nichols 2-2, 2-R, 2-1B; Connor bohne 2-2, 2-R, 2-1B, 2-RBI; Dj Spruill 2-2, 2-1B, 2-RBI; Aiden Gibson 2-2, 1-R, 2-1-B, 1-RBI; Bryson Driver 1-3, 1-R, 1-1B, 1-RBI; Maddox Patenaude 1-2, 1-R, 1-1B. Leading Hitters- Pizza Inn: Hayden Turner 1-2, 1-R, 1-1B; Landon Riley 1-2, 1-R, 1-1B; Thomas Taylor 1-2, 1-1B; Bryson Bass 1-2, 1-R, 1-1B, 1-RBI; Julien Scott Williford 1-2, 1-R, 1-1B; Seth Waller 1-1, 1-R, 1-1B; Bentley Robinson 1-1, 1-1B, 2-RBI; Jackson Batts 1-1, 1-1B, 1-RBI; Mac Batts 1-1, 1-R, 1-1B; Caelan Denham 1-RBI. Leading Hitters- Golden Circle Optimist: Nathan Skinner 3-3, 3-R, 2-1B, 1-2B, 3-RBI; Clark Johnson 2-3, 3-R, 1-1B,1-2B, 1-BB, 1-RBI; Dylan Morgan 1-2, 1-R, 1-2-B, 1-RBI; Davison Metts 1-2. 2-R, 1-B, 1-BB,1-RBI; Dmor Banks 1-2, 1-R, 1-1B; Christian Sutton 1-R, 2-BB; Brandon Near 1-R, 1-BB, 1-RBI; Lee Lovitt 1-R, 2-BB; Landon Moore 2-BB; Isaac Hooper 1-BB, 1-RBI; Riley Phillips 2-R, 2-BB. Leading Hitters- Stone Creek Masonry; Eli Kicklighter 2-R, 2-BB; Noah Parker 2-R, 2-BB; Joshua Simmons 2-R, 1-BB; Briley Futrell 1-R, 2-BB; Gavin Harris 1-R, 1-BB; Avery Barnes 1-R, 1-BB; Garland Robbins 1-R, 1-BB; Peyton Herring 1-R, 1-BB; Colton Ferris 1-R, 2-BB; Jim Such 1-R, 1-BB. Leading Hitters- Joyners: Jackson Lynch 2-3, 2-R, 2-1B, 1-BB; Zachary Beal 2-2, 2-R, 2-1B, 2-RBI; Ethan Arizpe 1-2, 1-R, 1-3B, 1-RBI; Colin Mcdermott 1-1, 1-R, 1-2B, 1-BB, 1-RBI; Samuel Herndon 1-2, 1-2B, 2-RBI; Jacarri Artis 1-1, 1-1B, 1-RBI; Braxton Hall 2-R, 2-BB; Kaden Campbell 2-R, 2-BB; Gavin Godwin 1-R, 2-BB; Alexander Herndon 1-R. Leading Hitters- Jersey Mikes: Nicholas Bynum 2-2, 2-R, 1-2B, 1-HR, 3-RBI; Elliot Wheeler 1-2, 1-R, 1-2B; Anthony Ellis 1-2, 1-R, 1-HR, 2-RBI; Davis Pittman 2-R, 2-BB; Juliana Jones 1-BB; Connor Samson 1-R, 1-BB; Charles Oates 1-BB; Louis Betancourt 1-BB. Leading Hitters- Adams Flooring: Seth Newsome 1-1, 1-R, 1-1B, 1-BB; Michael Gay 1-R, 1-BB; Adron Edwards 2-R, 2-2B; Lawson Boykin 1-R, 1-BB; Jc Manning 2-R, 2-BB; Jaylen Foster 2-BB; Liam Hockaday 1-BB, 1-RBI; Owen Coffey 1-BB. Leading Hitters- Tobs: Ayden Frazier 2-2, 1-R, 2-1B, 2-RBI; John Royer 1-1, 1-R, 1-2B, 1-BB, 1-RBI; Ahmad Sellers 1-2, 1-R, 1-3B, 2-RBI; Michael Brewer 1-1, 2-R, 1-1B, 1-BB, 1-RBI; Brayden Waniorek 1-R, 1-BB; Connor Dorough 1-BB; Ethan Hurd 1-R, 1-BB; Ethan Kriger 1-R, 1-BB. Leading Hitters- Vets Pets: Mason Fitch 2-3, 1-R, 1-1B, 1-2B; William Lanier 2-2, 1-R, 2-2B, 1-BB, 2-RBI; Mattox Mckeel 1-1, 3-R, 1-2B, 2-BB; Austin Coughlin 1-3, 2-R, 1-1B, 2-RBI; David Worth Joyner 1-RBI; Aston Holland 1-R, 1-BB; Ty’relle Sommirs 1-BB; Elijah Kirby 1-R. Leading Hitters- B&S Tire: Trent Jones 1-2, 1-1B; Jacob Pridgen 1-BB; Zachary Taylor 1-R, 1-BB; Greyson Crocker 1-BB; Connor Spruill 1-R; Christopher Keeler 1-R, 1-BB. Leading Hitters- NCBM: Noah Warren 1-2, 1-R, 1-1B; Tanner Pierce 1-2, 1-R, 1-1B; Christopher Howard 1-1, 1-1B, 3-RBI; Spencer Bass- 1-R, 1BB. Leading Hitters- Farris & Farris: Michael Tyler 2-2, 3-R, 2-1B, 2-BB, 1-RBI, Colby Barnhill 2-3, 2-R, 2-1B, 1-BB, 2-RBI; Archie Davis 1-2, 1-R, 1-1B, 1-BB, 1-RBI; Joel Breiholz 1-3, 3-R, 1-1B, 2-BB; Luke Moran 1-4, 1-1B, 1-RBI; Gavin Craft 1-2, 1-1B, 1-RBI; Camden Harold 1-BB, Trevor Moore 1-R; Dillon Bunn 1-R, 2-BB; Ethan Stallings 1-R, 1-BB; Brayden Brown 1-R, 1-BB, 1-RBI. Leading Hitters- EB Sports: Lennon Warren 3-4, 3-R, 2-1B, 1-2B, 2-RBI; Brayden Parker 3-4, 1-R, 2-1B, 1-2B, 2-RBI; Nathan Matthews 3-3, 2-R, 3-2B; Connor Radford 2-4, 2-R, 2-2B, 3-RBI; Landon Cuddington 3-BB, 1-RBI; Cj Summerlin 1-RBI; Colton Bridgers 1-R, 1-BB; Tyler Poythress 1-R, 2-BB; Peyton Gardener 2-R, 2-BB; Talon Gardener- 1-R, 1-BB; Eli Dixon 1-BB. Leading Hitters- Breakfast Optimist: Jake Harris 1-2, 1-1B; Seth Evans 1-2, 1-1B, 1-RBI; Stone Massey 1-3, 1-2B, 1-RBI; Connor Todd 1-R, 1-BB; Seth Scott 1-R; Daniel Holloman 1-BB. Leading Hitters- Creech’s Plumbing: Carter Adams 2-3, 1-R, 2-1B; Maddox Deans 2-3, 1-R, 1-1B, 1-2B, 3-RBI; Joshua Taylor 1-3, 1-R, 1-1B; Will Doll 1-3, 1-1B, 1-RBI; Ross Hinnant 1-3, 1-1B; Ryan Bass 1-R, 1-BB. Leading Hitters- Greenlight: Simon Quinn 1-3, 1-2B; Deandre Sellers 1-3, 1-1B; Charlie Scott 1-2, 1-1B. Leading Hitters- BB&T: Joe Glover 2-3, 2-R, 1-1B, 1-HR, 4-RBI; Shea Whitley 2-3, 1-R, 1-1B, 1-2B, 2-RBI; Evan Ferrell 1-3, 1-R, 1-1B, 1-RBI; Josef Popowitch 1-1, 2-R, 1-1B, 2-BB; Landon Brown 1-2, 1-R, 1-1B; Tanner Rigsbee 1-R, Zachary Mckenzie 1-R, 1-BB; Landon Strickland 1-R, 1-BB.